When, in 1810, Franz Joseph Gall said: “The measure of culpability and the measure of punishment can not be determined by a study of the illegal act, but only by a study of the individual committing it,” he expressed an idea which has, in late years, come to be regarded as a trite truism. This called forth as an unavoidable consequence a more lively interest on the part of various social agencies in the personality of the criminal, with the resultant gradually increasing conviction that the suppression of crime is not primarily a legal question, but is rather a problem for the physician, sociologist, and economist. Whatever light has been thrown in recent years upon this most important social problem, criminality, did not issue from a contemplation of the abstract and more or less sterile theses on crime and punishment as reflected in current works on criminal law and procedure, but was the result of research carried on at the hands of the physician, especially the psychopathologist, sociologist, and economist. The slogan of the modern criminologist is, “intensive study of the individual delinquent from all angles and points of view”, rather than mere insistence upon the precise application of a definite kind of punishment to a definite crime as outlined by statute. Indeed, the whole idea of punishment is giving way to the idea of correction and reformation. This radical change of tendency cannot be looked upon as a mere misdirected sentimentality on the part of modern society, but is the inevitable result of the final conviction that the solely punitive criminology upon which society has been relying in its efforts to eradicate criminal behavior from its midst has proved a total failure. The idea of punishment as a deterrent of crime is, as a consequence, gradually losing its hold upon modern criminologists, and in its stead we have been experimenting for some time past with such measures as probation, suspended or indeterminate sentence, and parole. Now it can not be too strongly emphasized that in giving these measures a fair trial we ought to guard against those very same grave errors which were chiefly responsible for the failure of the old, solely punitive methods, namely, the dealing with the criminal act rather than with the individual committing it. If these new measures of probation, suspended sentence, and parole, which are perfectly adequate in theory, are to justify their existence in the practical everyday handling of the problem of criminology, we must not fail to take into full account the very obvious natural phenomenon that human beings vary within very wide limits in their susceptibility to correction or reformation, that some individuals because of their psychological make-up, either qualitative or quantitative, are absolutely and permanently incorrigible and present a problem which can be dealt with in only one effective way—namely, permanent segregation and isolation from society. It is on this very important account that the psychopathologist’s place in criminology is fully justified. In endeavoring to aid in the solution of the problem of criminology, the psychopathologist need not seek new methods of procedure but may safely rely upon those which have aided him in elucidating in a very large measure the problem of mental disease. For criminology is an integral part of psychopathology, crime is a type of abnormal conduct which expresses a failure of proper adjustment at the psychological level. It was not until the advent of the Kraepelinian School of psychiatry, with its intensive search for facts and the resultant more accurate delineation and classification of types of mental disorder, that we began to acquire real insight into psychopathology and were enabled to render more accurate prognoses. This more or less purely descriptive method of study is at present being followed by an intensive analysis of the facts thus gained as exemplified in the present psychoanalytic movement. It is conceded by all thoughtful observers that criminology will have to follow the same route on its way to final solution. The series of studies here presented reflect an effort in this direction. 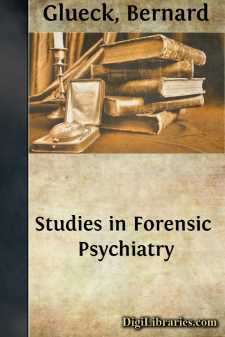 It is aimed to present a series of well-rounded-out case histories of criminal types as studied from the psychopathologist’s viewpoint, and in one instance, at least, an attempt is made at an accurate and intensive psychological analysis of the biological forces which were at the bottom of a career of habitual stealing. No attempt is made at hard and fast formulations. Our knowledge concerning the criminal is still too meager to justify one in drawing dependable conclusions. But it is felt that this clinical material emphasizes sufficiently the necessity of the psychopathological mode of approach to the problem of criminology. For that matter, the excellent work being carried on by Dr. William Healy in connection with the Chicago Juvenile Court and by psychopathologists in a number of other cities attests that this need is being gradually recognized by society. One desires only to express the hope that the time is not far distant when our penal and reformatory institutions will likewise serve the purpose of clinics for the study of the delinquent, and that such clinical instruction will form part of the curriculum of at least every public prosecutor. I desire to express my indebtedness to Messrs. Lea and Febiger, the J. B. Lippincott Co., and to the editors of the American Journal of Insanity, and the Journal of the American Institute of Criminal Law and Criminology, for their kind permission to reprint some of the material herein presented. Before concluding this preface I desire to avail myself of this opportunity of expressing my sincere gratitude to Dr. William A. White, Superintendent of the Government Hospital for the Insane, for his kind and very stimulating advice and encouragement which made these studies possible. Government Hospital for the Insane,January, 1916.